What is it with reclusive pianists? They all seem to like Deutsche Grammophon, though. Unlike Martha Argerich, who won't perform alone, Grigory Sokolov will hardly perform at all. He's the Carlos Kleiber of pianists, an indisputable genius who rarely shares any of that with the world. Sokolov's limited engagements – unlike the conductor's – seem to stem less from nerves and more for a distaste for anything extra-musical. He is neither a showman on stage or in person, and shows indifference for anything that isn't on the page, or within his heart. From a media perspective, he's an oddity. From a musical one, he's a genius. 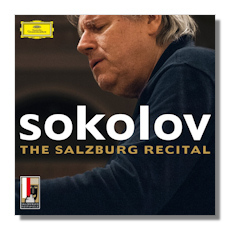 With reluctance, the pianist allowed this 2008 Salzburg recital for release. It's a marvelous program, filled with some startling insights and a real depth. The two Mozart sonatas – works that I generally ignore entirely – are played with astounding seriousness, but also a generosity of spirit that is wholly moving. Details are everywhere, but you never get the impression that the music is over-thought or over-wrought. The generally quiet audience proves distracting only a few times, but the sound is very good. The Chopin Préludes are tremendously convincing, and a lifetime of experience is reflected in every bar. Sure, the "Raindrop" might be a touch heavy, an observation that may also apply to a few others, but more often than not, one is struck by how carefully considered each miniature is. The two Chopin encores are equally mesmerizing, with a kind of hushed rapture that holds the attention. Encores can be noisy affairs, but happily the audience chooses to remain silent. Other encores include two selections from Scriabin's typically quirky and rather whimsical Poème, Op. 69, as well as the thoughtfully articulated Rameau.